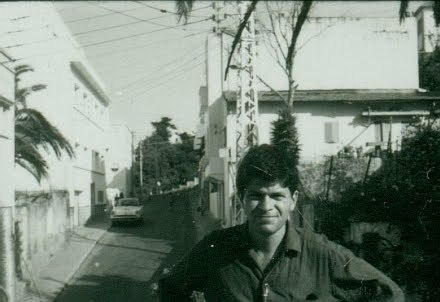 Yesterday’s posting of a reading by the young John Wieners from the San Francisco Poetry Center Archives (The Poetry Center Digital Archive) inspires us to post another from the same source – Gregory Corso – a relatively subdued Gregory Corso, it has to be said, but then he’s only 26, it’s 1956, the world is still about to open, he’s yet to publish his ground-breaking City Lights book, Gasoline. He has published his first book, The Vestal Lady on Brattle (1955), where several of the poems he reads on this occasion have just recently appeared. The highlight of this reading (the”message poem”, “it’s actually a message poem, but it gets straightened out”, Gregory declares), is the 12-minute meditation/invocation/litany/observation “Power”. Among the other poems he reads are such classics as “Greenwich Village Suicide”, “Coney Island”, “Sea Chanty”, “Mad Yak”, “Vision Epizootic”, “In the Early Morning”, and his elegy, “Requiem for (Charlie) “Bird” Parker” (“I hate to write any kind of requiems or any kind of elegy because it’s phony, but this one’s not phony and it’s true and I’m sure that he would have liked it”). Two decades on (June 5, 1975) and Gregory’s at the recently-established NAROPA, conducting a class, substituting for Allen. “Ask me anything”, he invites his students, “I know all there is to know because there ain’t that much to know”. He begins with “three shots” – Egyptian hieroglyphics, the Missing Link, and…Assholes! This recording consists of an amalgam of two classes. As the Internet Archive note alongside the recording explains: “Corso holds the class(es) in a “Socratic” format, allowing the students to ask him questions about anything they wish. He describes his process of shaping and editing a poem..(he) also talks about his family and relations with members of the Beat generation”. The Internet Archive also contains other Corso NAROPA audio, from ’77, from ’81 (we’ll be getting back to all that in the months to come). There’s also great Gregory participation in the following: a (1997) KCRW memorial recording for Allen, lovingly produced and presented by Liza Richardson. From the program notes: “This show features a conversation between Allen Ginsberg and Gregory Corso. Together they philosophize about the nature of life, death, beauty and poetry..”). Gregory remains a one-of-a-kind, unforgotten.